Along with the amazing china hutch that we acquired from Kurt’s parent’s were not one but TWO beautiful wingback reclining chairs in perfect condition. I had been wanting a chair like this to replace our clunky recliner. With our house being small, large furniture really crowds our space. 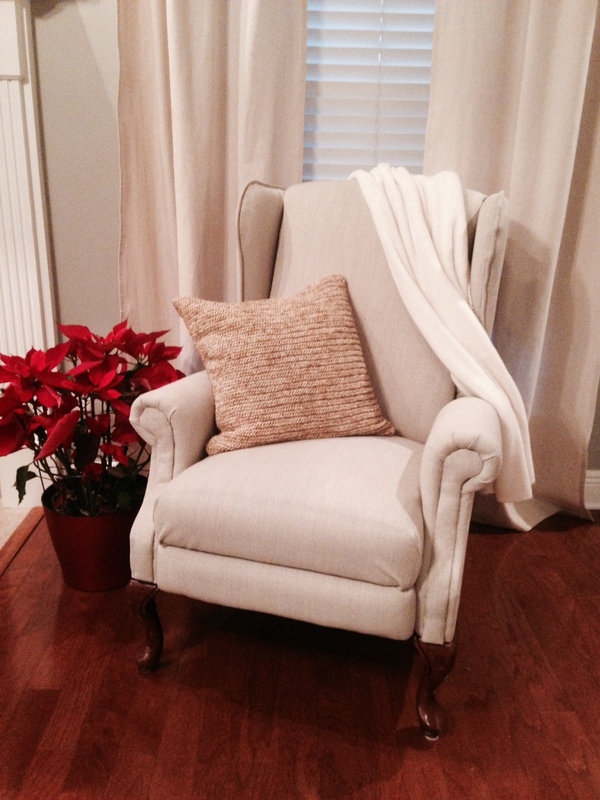 A re-uphlolstered wingback chair would fit nicely! 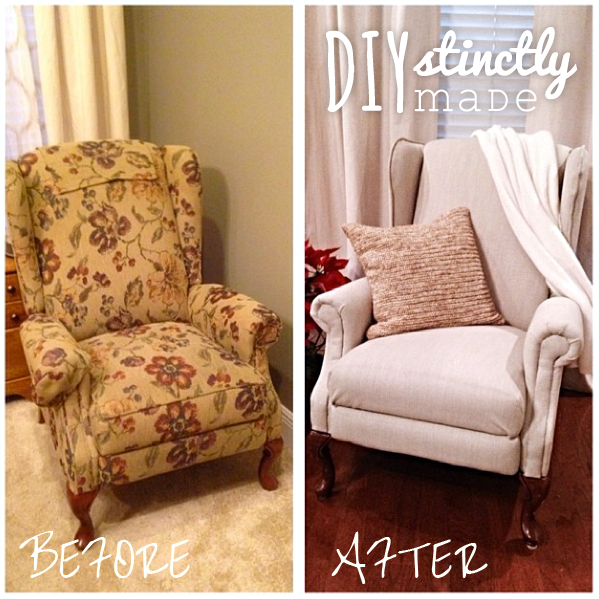 I had been researching re-upholstery how-to’s and came across Make it & Love it’s Re-upholstery 101 post and knew I could do it. On Black Friday, I went to JoAnn’s and used a gift card I had gotten for my birthday and bought some upholstering fabric. For furniture, it’s important to use durable upholstery fabric that will hold up to everyday wear and tear. Because it’s a better quality, it’s more expensive but it’s STILL less than buying a whole new chair. And you can pick-out whatever pattern you want. With my gift card and the black Friday sale, I got 10 yards of fabric for less than $100 (5 yards of different fabric for each chair). 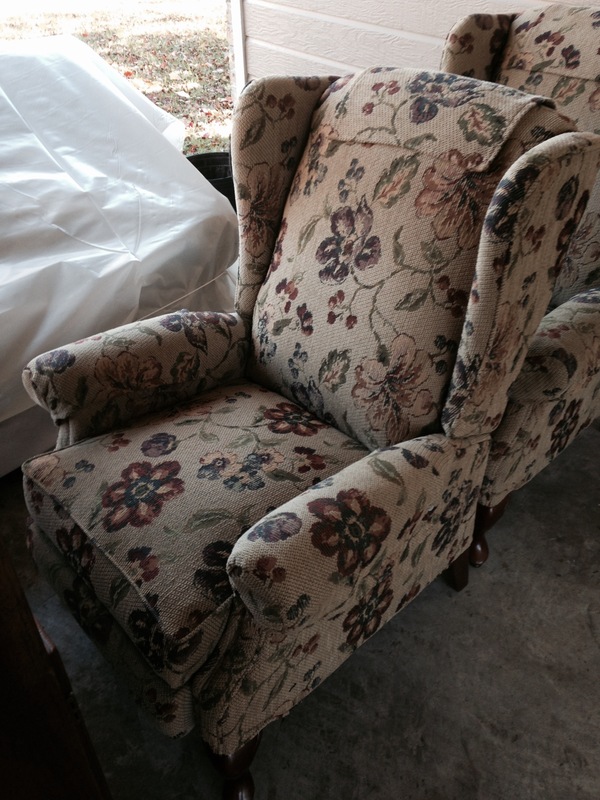 Here’s the fabric I used for this chair. I started by removing staples… lots and lots of staples. During this process, I learned that upholstered furniture, for the most part, is held together by only staples. The best technique for removing staples for me was grabbing each one with a pair of needle nose pliers and twisting. You want to be careful not to mangle the pieces your removing too badly as these will serve as your pattern for your new fabric. I was gentle when removing the tack strips (metal strips with nails) so I was able to use those again. 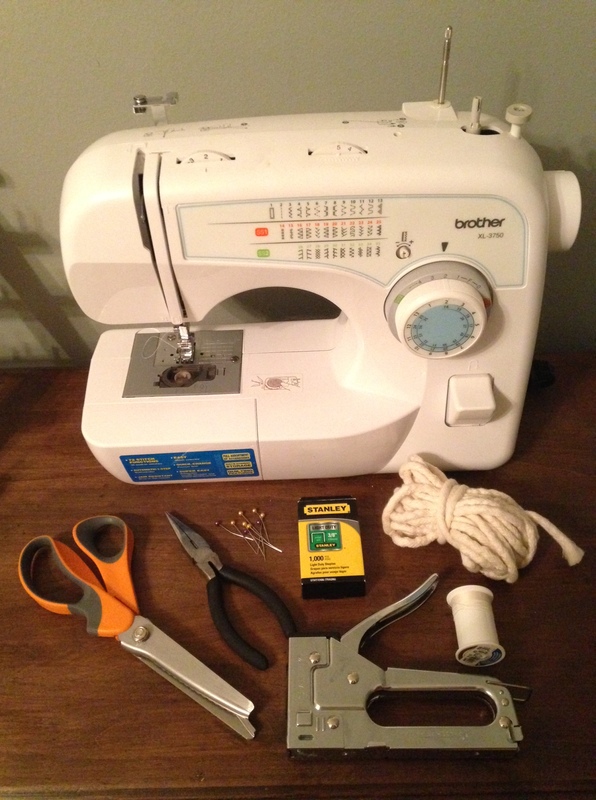 Make several mental notes as you remove the fabric. I took pictures of each piece coming off so I could have something to go back to if needed. After removing all the staples, and withstanding some serious palm bruising, I laid the old pieces on the new fabric and began to cut. I definitely recommend laying everything out at once in the beginning – I didn’t do this at first and barely had enough fabric due to careless cutting. 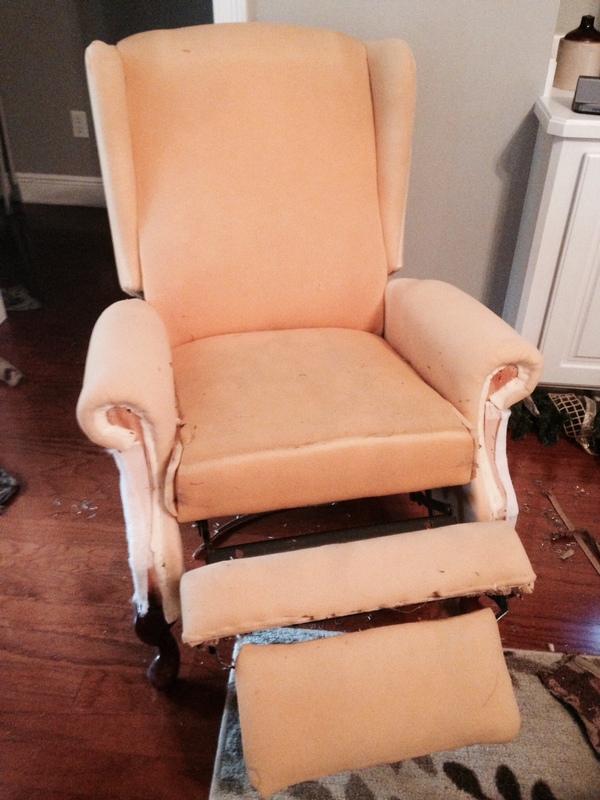 Once your pieces are cut, you can begin reassembling your chair (or whatever your working on). You’ll need to work backwards and start with the last piece that came off. This is the fun part! Re-upholstering is a great way to get your frustrations out… especially if a chore you asked your husband to do last week still hasn’t been done – I mean, what? I did have a little bit of sewing. The wings were joined together with piping in between. 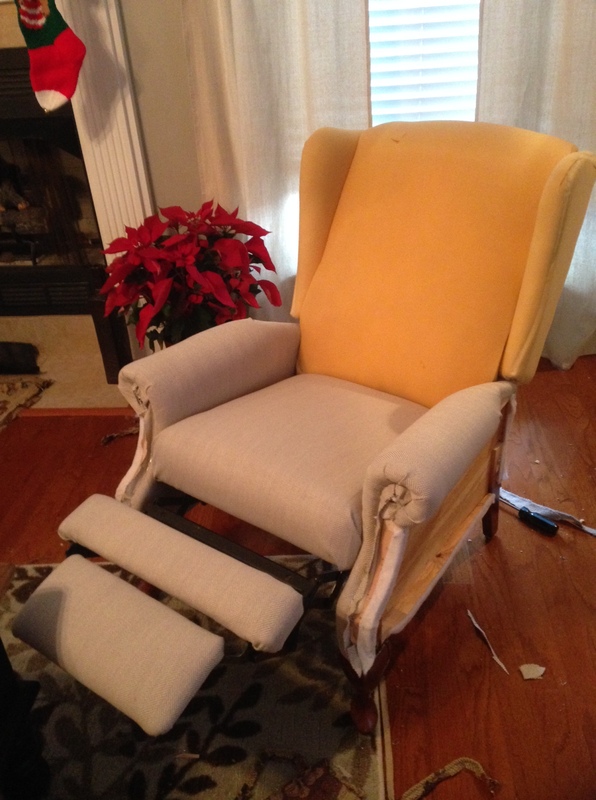 I made my own piping by wrapping piping rope in the chair’s fabric and sewing together. 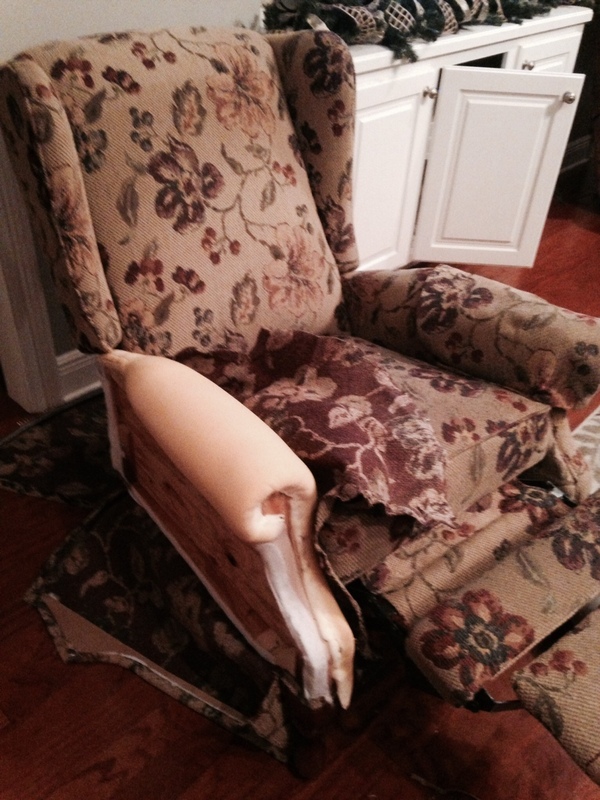 Because our chair was a recliner, maneuvering the fabric around the reclining hardware was a little tricky. There were certain parts that had obviously been upholstered before the chair was assembled but I WAS NOT disassembling the chair. 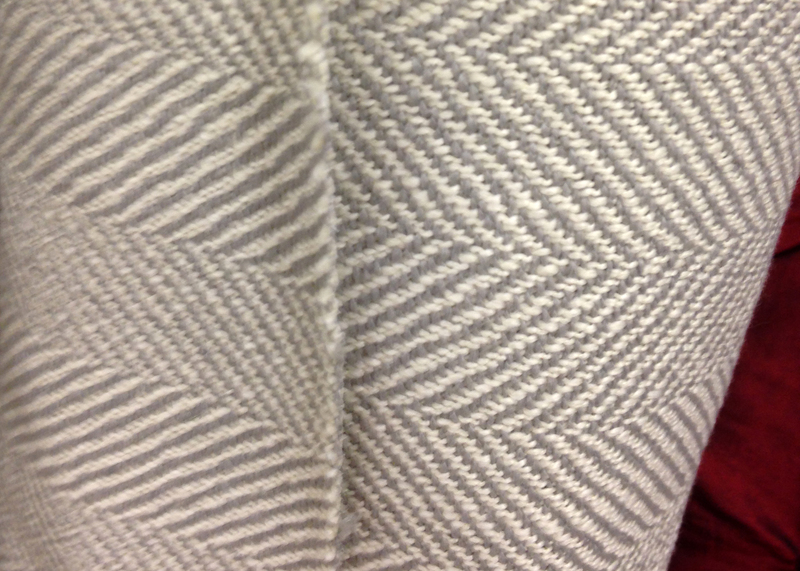 I made do by cutting extra fabric and placing where it was needed. It still doesn’t look perfect but you can’t tell unless someone reclines in it… which only happens when we have visitors… and that’s not very often. I have to say, I’m pretty pleased with the way it came out. It’s exactly what I had in mind for that spot and is the perfect up-cycled addition to our DIYstinctly Made home. Wow! Thank you thank you!!! I need to find some blogs to nominate and I’ll make a post!